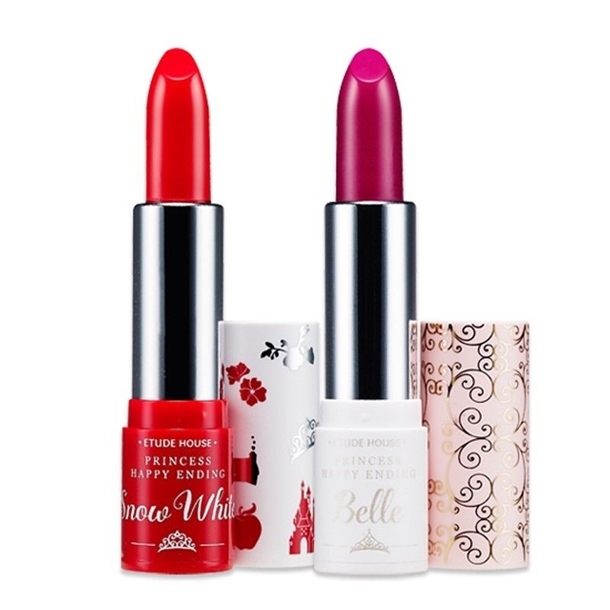 Etude House meets Disney's Fairytale Princesses - Snow White, Belle, Cinderella, Jasmine. This Limited Edition collection is another one of Etude House's many gorgeous creations. They outer boxes are made like little books....so CUTE! And I have to mention again how awesome the reasonable prices are! Why isn't this brand in India yet???!!! The only sad thing is, I missed out on the lipsticks because they sold out everywhere. I know I'm still on my Lipstick Ban, but the packaging is too pweety! (Pic below). I also didn't get anything from the Jasmine pieces - a mascara & nail set. I don't know if I'll ever have the heart to touch that design! Etude House Princess Happy Ending Snow White Precious Mineral BB Cream SPF 30 / PA++ Natural Beige W13 ~ This BB Cream comes with a 'slim layer fit formula' that smoothly glides onto skin even when you apply several layers, helping to express clean, bright and smooth skin with its mother of pearl. Available in one more shade N02 Light Beige, which is lighter. Squeeze tube with a pump - always nice! Etude House Princess Happy Ending Cinderella Fairy Glitter Shadow #1 Pink Glass Heels ~ This is like pressed glitter - So gorgeous! These are the lipsticks that were SOLD OUT. Actually, I had a chance but I put off ordering them for many weeks. They will haunt me for a long time. I...I can't look at them anymore! "Everything's going to be alright." ~ Snow White's Happy Ending. "I want so much more than they've got planned." ~ Belle's Happy Ending. "I'm like a shooting star." ~ Jasmine's Happy Ending. "If you keep on believing, the dream that you wish will come true." ~ Cinderella's Ending. FREE Shipping & Delivery took about 1 week, which is very quick. Which product did you like the most? I have bought from this seller..a few samples and nail polishes..they deliver quickly. Wowm this is so cute! Packaging is very cute. Blushes remind me of Milani's limited blush collection. Love love that coral blush and the pink cream shadow! Both shades are stunning! OMG!!! This collection is so pretty!!!! This will be included in my wishlist!!!! !